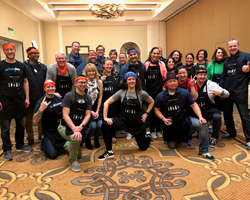 Lajollacooks4u, San Diego’s premiere team-building and cooking events company, is proud to announce that it can now accommodate teams of 30 people or more in an off-site venue of their choosing. Selected venues have included hotels and conference centers, and most recently, the team-building company has hosted its cooking events at the Estancia Hotel and the Hilton Torrey Pines in La Jolla. When companies select Lajollacooks4u, they receive a completely customized experience – right down to the menu, location and budget. Team members are also able to choose from a variety of popular cooking packages, which include Iron Chef-style competitions, Foodie Truck Challenges, pizza-making challenges, tapas cook-offs and more. Each package offers team members an opportunity to collaborate and compete; all while preparing nutritious and delicious farm-to-table recipes. Once the team-building event begins, team members play several different icebreakers to form into teams and then are assigned a dish to prepare – either an appetizer, entrée or dessert. Friendly competition ensues, and each team works together to complete their dish in the allotted amount of time. In addition to the cooking, many of the programs have a fun marketing component, as well. Teams are provided with a bucket of art supplies and poster board to create a 30-second infomercial, which ensures that all team members are participating in the competition. The teams are judged on taste, presentation and marketing quality, and once the winning team is crowned, team members reconvene to enjoy the meal they each helped prepare. For groups of 30 people or less, Lajollacooks4u hosts events at its La Jolla location, a picturesque venue atop Mt. Soledad overlooking the Pacific Ocean. It is currently undergoing a complete renovation of its kitchen and plans to unveil the finished product later this month. With additional workspace, updated appliances and modern lighting and fixtures, the new state-of-the-art kitchen is expected to provide an even more intimate and memorable cooking and dining experience for the many guests who will visit the venue.